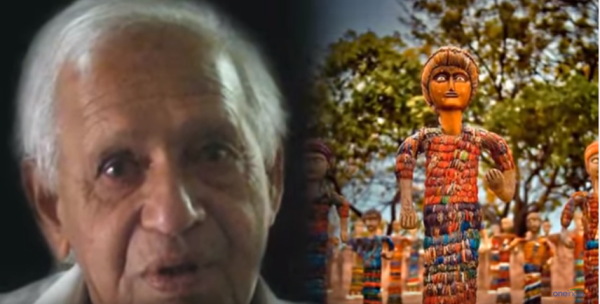 On a visit to famous Rock Garden, in early 1980, we were fortunate to have a meeting with Mr Nek Chand the creator Rock Garden of Chandigarh, India He presented us with terracotta beaded string, Garland. The Rock Garden is not only fascinating but also an inspiration for Sustainable Living. Nek Chand was a Government road inspector in PWD (public works department) who wanted to create something new. He knew that area (gorge) had been selected as a land conservancy; a forest barrier confirmed in 1902 that nothing could be made on. Nek Chand used empty drums of tar and made the barrier so that his activities would not be noticeable. He would use and carry on his cycle to dump the waste material gathered from the city. The Rock Garden of Chandigarh is a statues plot in Chandigarh, India, also acknowledged as Nek Chand’s Rock Garden. Its founder Nek Chand, a state official who began the work silently in his extra time from 1957. Now it is covered over an area of 40 acres (161874.25 m²). Constructed entirely of industrial and home waste and cast-away items. It highlights objects like palaces, soldiers, monkeys, village life, women and temples. The material used in creating these masterpieces are mostly rocks, boulders, broken chinaware, discarded fluorescent tubes, colored glass bangles, building waste, coal and clay. Iconic Rock Garden originator Late Nek Chand, The 90-year-old Padma Shri (A civilian honour by the Government) awardee has millions of fans around the world. He was bestowed the Grande Médaille de Vermeil in Paris in 1980. The Rock Garden is near Sukhna Lake and consists of interlinked man-made waterfalls. Many other statues that have got made of trash and different kinds of scraps (glass bottles, broken glasses, bangles, tiles, ceramic pots, sinks, electrical waste, etc.) which remain set in walled tracks. 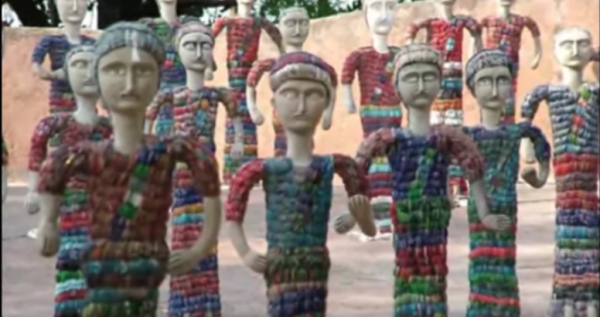 In his extra time, Nek Chand began to gather materials from destroyed sites around the city. He recovered these materials into his concept of the heavenly kingdom of Sukrani, choosing a canyon in a jungle near Sukhna Lake for his performance. The ravine had got designated as a land conservancy, a forest buffer established in 1902 that nothing would formulate there. Chand’s work was not legal, but he was able to hide it for 18 years before the authorities discovered it in 1975. Until then, it had grown into a 12-acre (49,000 m2) complex of interlinked courtyards, each filled with hundreds of pottery covered detailed sculptures of dancers, performer, and creatures. His production was in threat of getting suspended, but he was able to get public sentiment on his side. In 1976, the park was introduced as a common area. Nek Chand was given a salary, a title (“Sub-Divisional Engineer, Rock Garden”), and 50 labourers so that he could concentrate full-time on his job. It appeared on an Indian stamp in 1983. The Rock Garden even now made out of recycled materials. With the government’s help, Chand was able to set up gathering centres throughout the city for scrap, especially waste and cracked crockery. When Chand went on a speech tour in 1996, the city reversed its funding, and destroyers vandalised the Rock Garden. The Rock Garden Society took over the management and conservation of this unique imaginary settings. It is not to be missed tourist spot of Chandigarh. Over 5000 visitors see this excellent place daily and the record stands for more than 12 million visitors since its conception. One can visit the place from 10 am to 7 pm and closed on Thursdays.